Brachiaria forage grasses are widely used for livestock production in the tropics. Signalgrass (Brachiaria decumbens cv. Basilisk, CIAT 606) is better adapted to low phosphorus (P) soils than ruzigrass (B. ruziziensis cv. Kennedy, CIAT 654), but the physiological basis of differences in low-P adaptation is unknown. We characterized morphological and physiological responses of signalgrass and ruzigrass to low P supply by growing both grasses for 30 days in nutrient solution with two levels of P supply using the hydroxyapatite pouch system. Ruzigrass produced more biomass at both levels of P supply whilst signalgrass appears to be a slower-growing grass. Both grasses increased biomass allocation to roots and had higher root acid phosphatase and phytase activities at low P supply. At low P supply, ruzigrass showed greater morphological plasticity as its leaf mass density and lateral root fraction increased. 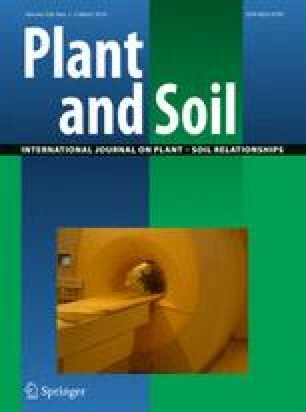 For signalgrass, morphological traits that are not responsive to variation in P supply might confer long-term ecological advantages contributing to its superior field persistence: greater shoot tissue mass density (dry matter content) might lower nutrient requirements while maintenance of lateral root growth might be important for nutrient acquisition in patchy soils. Physiological plasticity in nutrient partitioning between root classes was also evident for signalgrass as main roots had higher nutrient concentrations at high P supply. Our results highlight the importance of analyzing morphological and physiological trait profiles and determining the role of phenotypic plasticity to characterize differences in low-P adaptation between Brachiaria genotypes. Responsible Editor: Tim Simon George. Seeds of signalgrass and ruzigrass were provided by the International Center for Tropical Agriculture (CIAT), Cali, Colombia. This project is part of the research program of the North-South Centre of the Swiss Federal Institute of Technology (ETH-Zurich) “Livestock systems research in support of poor people”. It was jointly funded by ETH-Zurich and the Swiss Agency for Development and Cooperation (SDC).